We are going to use these tablecloths on Vacation for camping. 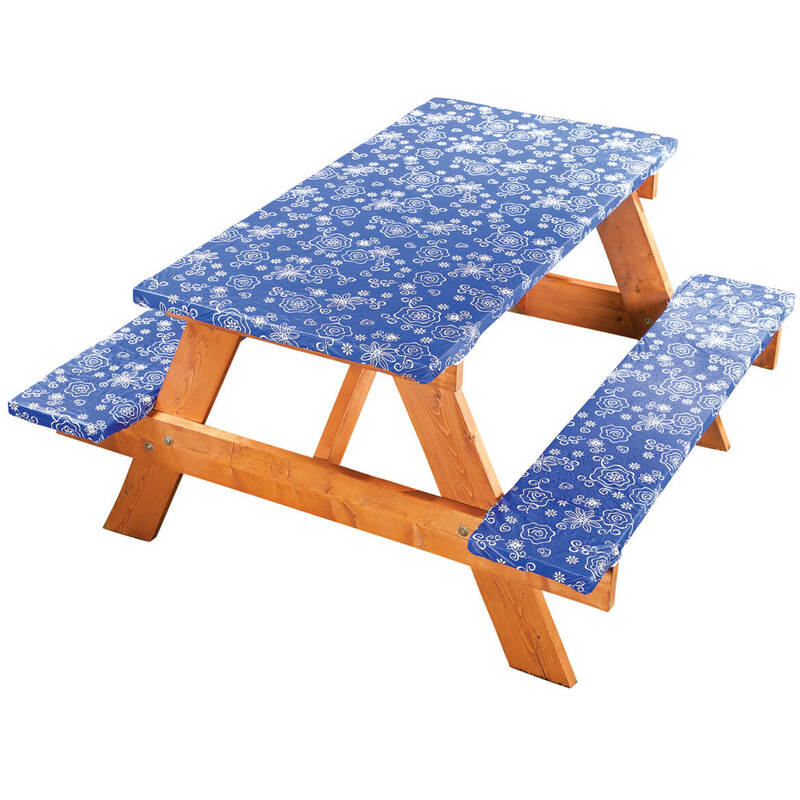 This set is great for camping, since it not only covers the picnic table ... but also both benches. Elasticized edges keep all three pieces in place, it adds a bright pop of color to the campsite, and everything easily wipes clean and dry. Thank you for offering this quality product at a great price! I like it but would have liked it better with a checked pattern over the flowered pattern.. Pretty but too thin and not long enough. Seriously! Measure your table. I have a small picnic table; MUCH smaller than you would see at a public park or campground. I assumed it would fit perfectly. I had to struggle to get it on, and tore it a bit in the process. Then I still had to use my table clips to keep it on. Well, this is the country, so it's good enough!!! Yes, I should have measured prior to ordering, but my table is small. It's way smaller than any table you'd see in a public park or campground. I managed to stretch it on, but it tore a little in the process, and I still had to use my table clips to secure it. It's good enough for my cabin in the woods! Items were too short for the tabletop and benches. Had to sew on ties to keep it from coming off. I strongly recommend saving your money. These are just too short to fit the picnic tables at campgrounds. I had purchased a set about 15 - 20 years ago that fit perfectly, don't know why they changed the size. Picnic table cover didn't fit. Very disappointed because measurements in product description seemed universal, or the average size. Wasted my money on this one. The elastic corners to fit the table and benches of the picnic table. This is the only place I have found that carries exactly what I need for my picnic table. Love the color choices. Last time I sat on a wooden park bench I got splinters. This was not pleasant. Hope these will make a difference. 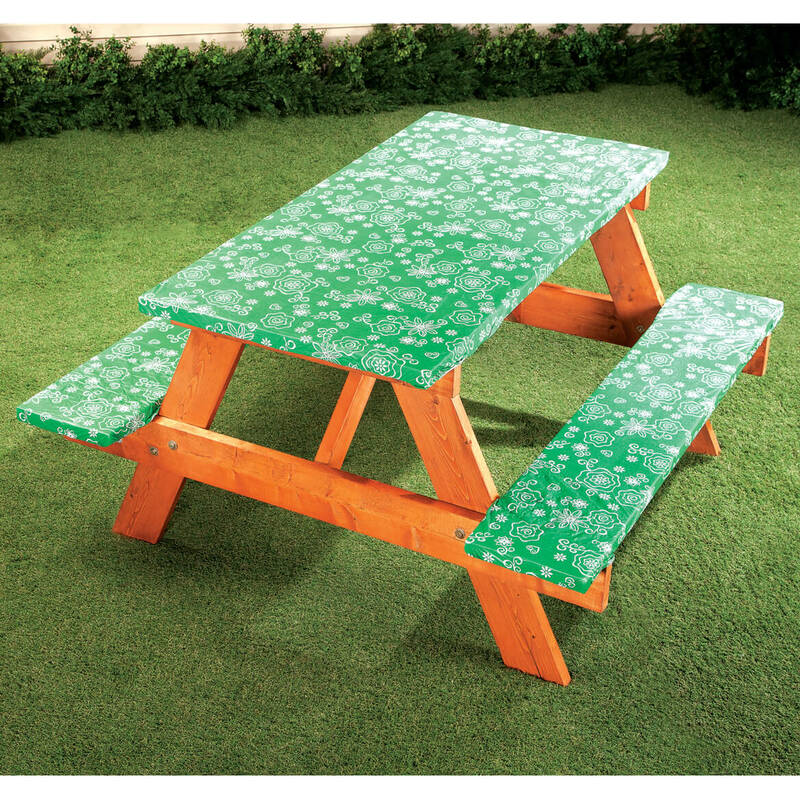 We go camping and these picnic table covers will work great to cover the picnic table and not get blown off by the wind. I chose this to protect the wood of my picnic table. I'm putting it on my picnic table outside for the summer. Looks great! because our picnic table is out all summer and gets dusty and dirty and when I don't have time to scrub it ,I can just throw these handy covers on. Also we can take them camping with us. My table is old and the paint is peeling off. has elastic edges to stay on table & benches & not on the ground. 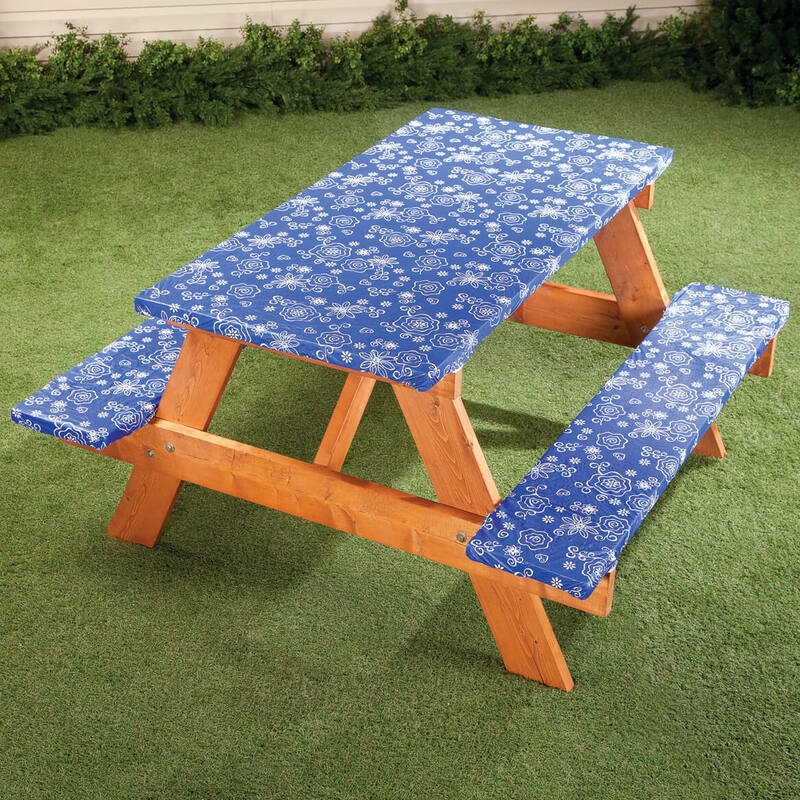 Do you have a picnic table cover for a 72" long table? BEST ANSWER: Thank you for your question. Unfortunately we do not have a cover that long. We hope this information will be of help to you. 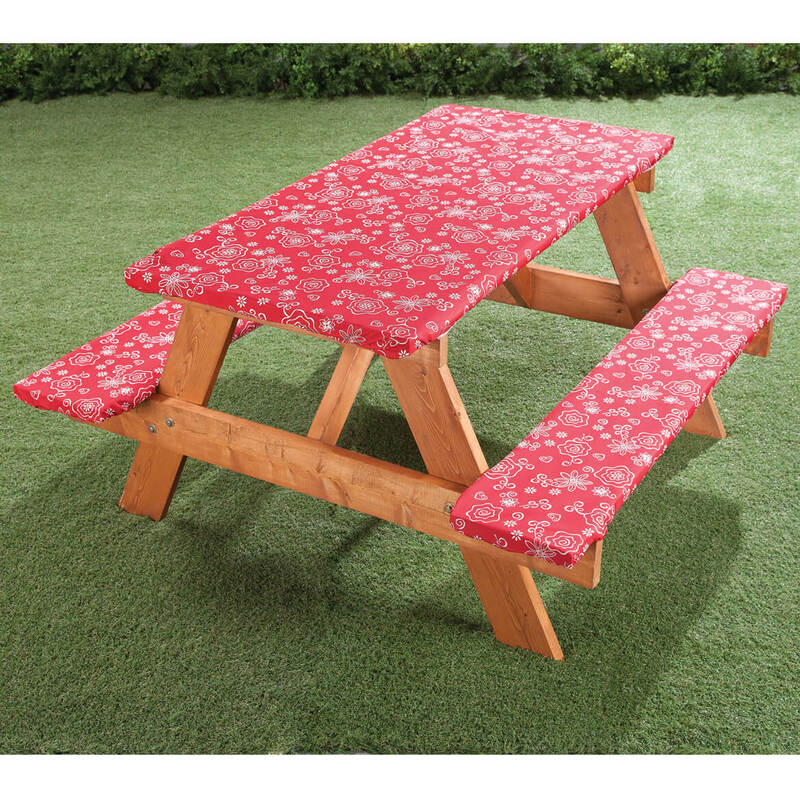 Dimensions of Picnic Table Cover? BEST ANSWER: Thank you for your question. The dimensions for the table cover are table 60" long x 34" wide, the two benches are 60" long by 16 1/2" wide. We hope this information will be of help to you.